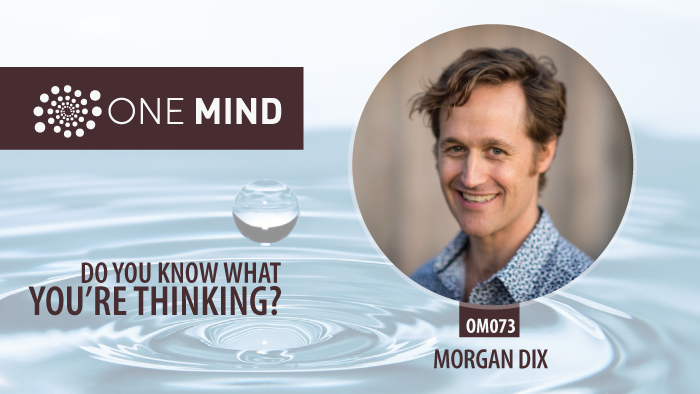 OM073: Do You Know What You're Thinking? 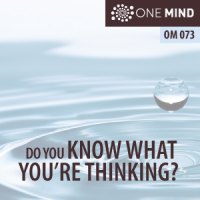 OM073: Do You Know What You’re Thinking? Have you ever paid attention to the way you think? Have you ever noticed that your thinking is often repetitive or unoriginal? One of the biggest things meditation can help you with is becoming aware of your habits of thought. Through regular and consistent practice, we slowly but surely lift up and out of the stream of thought that runs through our minds like a hypnotic river of glittering gold. Meditation gives you space from that thought stream. It helps us release our mostly unconscious and tenacious grip on our thoughts. And for most of us, we are deeply identified with what we think. And that’s not inherently a bad thing. It’s just that when we are not conscious of it, we tend to act and respond to life in ways that are not as conscious as we think. So meditation can help us identify deeply ingrained patterns of thought. How? Well, at its core, meditation is about letting go of everything…including our thoughts. In the process, we gain perspective on them. Like an aerial map, over we can start to discern patterns and habits. But why is that even important? It may be completely obvious to you. But let’s just be clear upfront. For one thing, what you think about every day has a huge effect on you. What you think affects your moods, your behavior, your choices, your emotional bandwidth, your outlook on life, your decisions. But the thing is, we are often blind to the deeply patterned and conditioned nature of our own thinking. And that’s one reason it can be hard to make big changes in our lives. In this episode, we explore how meditation can help to free you from deeply ingrained habits of mind and why that’s so important.